If you're looking for a unique Christmas or holiday gift for someone, don't forget to check out Uncommon Goods first. You're bound to find fun and interesting things that will make your loved ones smile. They have such a good mix of quirky, clever, and handcrafted designs that are created with both the artisans and environment in mind. I also admire the company's mission to support and promote ethically produced items both locally and internationally. I've been a fan of Uncommon Goods for a while now and was thrilled to have the opportunity to pick out one of their gift items. I take special care in choosing my jewelry and love displaying them in creative ways. Unfortunately, the birdcage jewelry stand I use now has become a little cluttered over the past year, so it was time to find something else to help organize my favorite pieces. 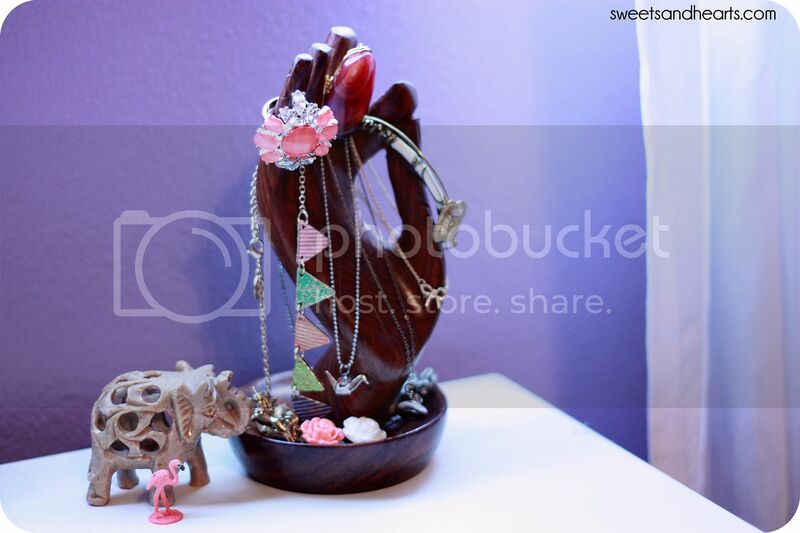 The "Hand of Buddha" stand is a wonderful and practical way for showing off a few special pieces on my nightstand--it's even beautiful on its own with its minimalist design. It's ideal for holding and draping necklaces, rings, and bracelets. Each one is handcarved from dark, rich sheesham wood by a craftsman in India and created under the supervision of an Indian non-profit that supports underprivileged artisans in the community. Knowing the back story makes it even more special. Click here to learn more about it or to purchase one of your own. If you'd like to see more jewelry displays or check out other gifts for women, click here! If you're looking for something extra special, they even have a section for personalized gifts here.